This program was started in 1996, and it gives schools in America 10 cents for every little coupon clipped and collected from the top of General Mills and other products. Yes, that's correct. TEN whole cents. For the last two and a half years, I've had a little Ziploc baggie tacked onto the cabinet above our stove. Every time I opened a box or bag of something with one of these little goodies on it, I would clip it and deposit it in the baggie. Occasionally when my Mom visits, she brings her own little collection as well and I dump them in the baggie, too. Last week a note came home from the boys' elementary school, reminding parents to clip those box tops and bring them in! I pulled off the baggie and decided to count out the coupons and take them over to the school at the end of the day. Can you guess what over two years worth of collection netted? 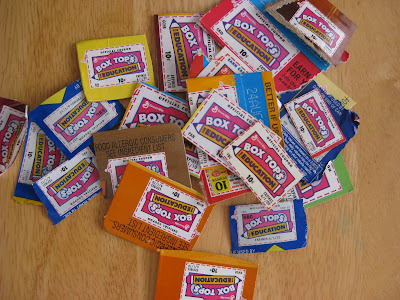 Twenty four box tops. Which is a whopping $2.40. Let's hope that some of these other PTA moms are doing more cooking than I do, or else we won't be able to buy mouse pads, let alone new computers! Frankly, I'm more inclined to just hand over some cash than to buy and use the specially marked products. That's all!!?? I get that much in about a month. Maybe I just buy different stuff than you. I turned in about 100 last year. But you are right that it does seem easier to just write them a check.